We have updated the Homology Modeling user interface, and have added the option to load multiple sequences at once. 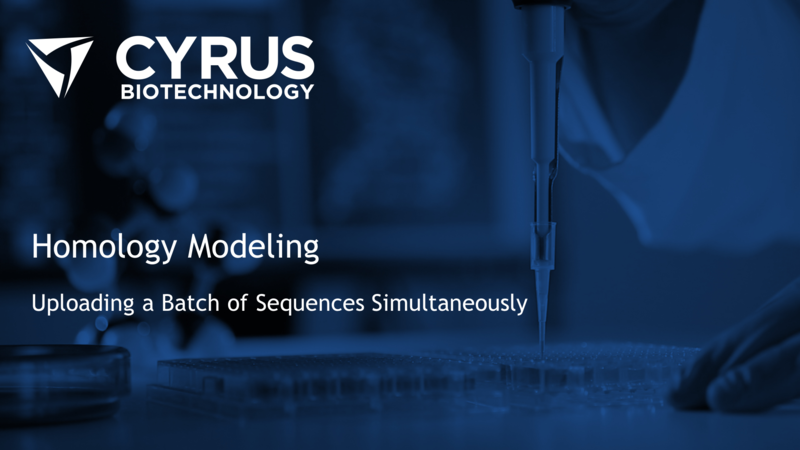 For more information on how to load a batch of sequences into HM, click here. Our newest CAD design tool is called Flex Design. This is similar to our current Design tool, but allows more backbone changes to occur in the area of design. This will allow more mutations to be sampled because the backbone can adjust to changes that are larger, smaller, or have a different polar nature. The backbone will only be allowed to make minor adjustments (within 0.5 Å ) in the region of design and the region up to 8 Å away. Cyrus’s FlexDesign Action runs Rosetta’s CoupledMoves protocol, which has emerged as the best generalized tool for predicting affinity-improving mutations at either a protein/protein or a protein/small-molecule interface, when starting from an existing interface in need of improvement. For a full description of Flex Design and how it relates to our original Design tool and a tool called Relax Design that will be released soon click here. For a tutorial on how to run Flex Design click here.